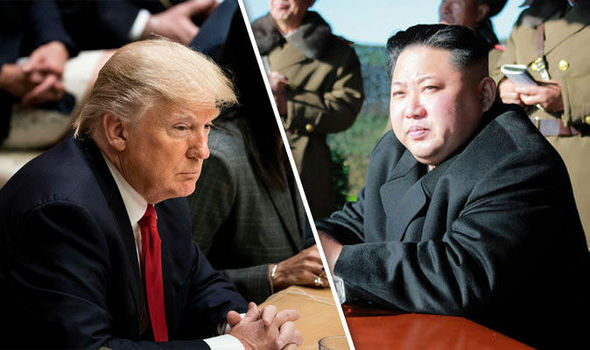 THE world’s powers are running out of time to stop North Korea becoming a grave nuclear threat to international security, according to one of Donald Trump’s chief advisors. North Korean leader Kim Jong-Un has stepped up aggression towards the United States and its allies in recent months with missile testing, including firing two rockets over Japan, into the Pacific Ocean. Now the US President’s National Security Advisor, General H.R. McMaster, has warned that a new sense of urgency is required among the allies if they are to stop Kim making further advances with his nuclear weapons programme. Speaking exclusively to international interviewer Daphne Barak, Gen. McMaster outlined the difficulties faced by the international community saying it was “impossible to predict” how the crisis would develop due to the nature of Kim’s brutal regime. He said: “This is a regime that has committed egregious crimes against its own people—that has carried out an assassination in a public airport using a banned nerve agent, and repeatedly shows its disregard for its international obligations. “How predictable is a regime like that, in terms of using the most destructive weapon on earth? “The President has made clear to the world that North Korea is now a grave threat to all of us. “Because it is a global problem, we see the international community joining us in sanctioning North Korea. "What is different today than in the past is urgency. North Korea is rapidly advancing its missile and nuclear capabilities. The General praised President Donald Trump for bringing the world together in condemnation of the North Korean leader, in particular his work with China. But he suggested the Chinese could do even more to help avert any further escalation in the crisis. He added: “A great achievement of President Trump—in addition to uniting many nations and building consensus—has been to work with China, and increase Beijing’s cooperation in pressuring North Korea, through imposing new sanctions, and by enforcing existing sanctions. “There may be limits on what China is willing to do. We’ll see. “But there’s no question that China has more leverage than any other country to convince North Korea that pursuing nuclear weapons is against Pyongyang’s own national security interests. We are not asking China to do us or anyone a favour. He also backed President Trump’s tough stance on talks warning the North Koreans that they must make the “first step” to bring lasting peace. Gen. McMaster said: "The President has directed us not to repeat the mistakes of the past. Past efforts have resulted in long, drawn out talks that delivered unsatisfactory, weak agreements that North Korea immediately broke. Worryingly, Gen.McMaster sees a similar threat growing in Iran despite the deal signed in 2015, the Joint Comprehensive Plan Of Action (JCPOA), where they promised to curb their nuclear ambitions. He said: "As President Trump has repeatedly said, the Iran nuclear deal was the worst deal of all time. “Iran can wait out the deal, and when it expires, have a threshold capability that will allow the regime to move toward nuclear weapons very quickly. "President Trump will make the decision about our ongoing participation in the JCPOA according to his top priority, which is the safety of the American people." The General wants the international community to make sure the deal is enforced more rigorously to stifle Tehran’s nuclear ambitions. He said: “The first step is to rigorously enforce the deal. There are all sorts of inspections which could be made and are not made. Discussing Afghanistan and Pakistan, the General signalled a change in focus compared to previous administrations. Regarding Afghanistan he said: “For too long we focused on tactics—debating the precise numbers of troops to commit - when our focus should have been on strategy – how to achieve a sustainable outcome in Afghanistan and South Asia consistent with US and our allies’ vital interests. He also signalled a change in dealing with the threat from terrorists within Pakistan, adding; “We are fundamentally changing how we approach the problem of terrorist safe havens in Pakistan. “The President expects Pakistan to take decisive action against terrorist groups based on its territory and will condition US security aid to Pakistan, accordingly. Turning to Iraq, the General was critical of the way the country was left to cope politically following the withdrawal of US troops. He said: “Most problems in Iraq today stem from our disengagement, before military gains were consolidated politically. “The complete withdrawal of US forces in 2011 led to the collapse of large portions of the Iraqi state and the rise ISIS, which led for example to the fall of Mosul. “Courageous Iraqi forces recently liberated that city, in part, because of President Trump's decision to prioritise the fight against ISIS and to give his commanders the necessary authority to fight and support partner forces more effectively. Regarding the country’s future, he explained: “Now is not the time to divide the country. If Iraq fragments, the main beneficiaries will be the Iranian regime or groups like ISIS, both of whom seek to perpetuate ethnic and sectarian conflict among Iraqis. In particular he pointed to the consensus surrounding Iran’s threat as evidence of hope to make lasting peaceful agreements in the region. He said: “What changed regionally can help change the problem. It can lead to new partnerships and relationships. “There is a greater alignment, among the Arabs against Iran. “If any Arab state would ask themselves: ‘What is the biggest threat to our security today?’ No one would say, it is Israel - it is Iran! “All the Arab states recognise the threat that Iran poses. Gen. McMaster also talked up the USA’s close bonds with Britain, backing up President Trump’s desire to strengthen the ‘special relationship’ after Brexit. “The US view is that we want to do everything we can to preserve and strengthen the special relationship. “We are bound together by common interests and values. The problems we face today are problems that demand international responses.